As an avid griller, you know that a good grill is a clean grill. 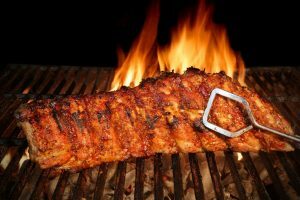 You also know that using a wire bristled brush can make quick work of cleaning all the grease and burnt pieces of food from the grill. You might even have a few tricks on how to make the job go even faster. But then you are stuck with the problem of cleaning the brush you use to do the cleaning of the grill. It is important to keep your grill clean, but also have the best grill brush to ensure your cooking surface is hygienic. In this piece we will help you with exactly that problem. How do you clean a grill brush and keep it lasting long enough to clean your grill after every cook out? We have a few tips. Another grill brush ( a clean one). It might seem strange but there is a point to this. Maintenance is key to keep any tool or piece of equipment in a well functioning condition. Your lowly grill brush is no different. So after each use, make sure that you don’t leave pieces of grime on the brush. Give it a knock against a hard surface to dislodge some of the more stubborn pieces so they don’t get comfortable and even more difficult to get out. Now it is time to use that second grill brush we made you get at the beginning. A second brush is very useful here because it does exactly what your trusty grill brush does, get into nooks and crannies. Use this second brush to really clean out all the bits and pieces from the dirty brush. Rub the bristles of the brushes against each other to really scratch loose all the tiny pieces. Keep doing this until all the pieces of debris have been removed (stop before you collapse from exhaustion). Take your bucket and fill it to about half way using the garden hose. Take some of the dishwashing liquid and add it to the water in the bucket. Swirl the water a bit so you get some nice bubbles in the water. Now take both of your brushes (the dirty one and the less dirty one) and dip them in the soapy water. Swirl them around a bit as well and then repeat the way you brushed them together earlier. The dishwashing soap will help you to get some of the more stubborn dirt and grease off the bristles and if it has a good grease cutting ingredient, this wont be a hard job. Keep doing this, dip the brushes and then scrub them together until you don’t see any greasy residue anymore. If you are satisfied that no additional scrubbing is needed to clean your brushes, rinse them under the cold water from the hose. Make sure that you rinse away all the soap, so you don’t have to clean them again to get rid of another type of residue. After you have given both the brushes a good shower, hang them up to dry. This is all you need to do to keep your brushes nice and clean. Empty the bucket into your garden (it is always good to reuse grey water) and give it a quick rinse as well. When the brushes have been in a sunny ventilated area for a while check if they are completely dry before storing them. So when do you stop cleaning the brush that has given you some good service and replace it with a new shiny one? There are a few signs that your brush will show, so you can know that it is time to get a new one. First, if is shows signs of rust it is time for a new one. A stainless steel brush should not rust, if it does the components probably aren’t completely stainless. A brass bristled brush will naturally rust over time and once it starts to show its age, you can replace it. 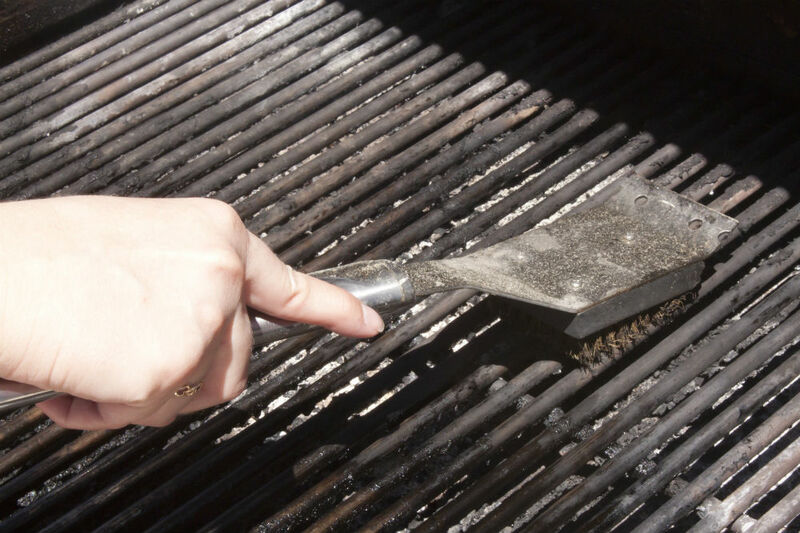 Rust particles will not be good for your grill, and it is a sign that the bristles have started to weaken. This means that your brush will not work as well as it used to. The second thing to look for is that a brush might also start to lose some of the weakened bristles, and that can become a real problem. If a small metal bristle gets stuck to your grill it might get into your food. No one enjoys metal bristles as seasoning and it can actually cause quite severe problems. So the bottom line is, replace that brush before it starts shedding like a dog. If you’re looking for a replacement brush, then look no further. Here are our top five recommended grill brushes. The Weber 6494 is a 12-inch, three sided grill brush that comes equipped with a range of amazing features crafted to make your task of cleaning a greasy grill easier and hassle-free. The brush ends up damaging and scratching the porcelain after continued usage, which means that this brush is suitable only on stainless grates. While the Weber 6494 may not be designed for cleaning up real hard stuff, the brush does a good job of cleaning up most of the grease and burnt out material left back on the grill after cooking. It is certainly not be the best option if you grill has porcelain-coated cast iron grates, but if they happen to be stainless grates, this brush will be of great help for a fast, easy and in-depth cleaning. 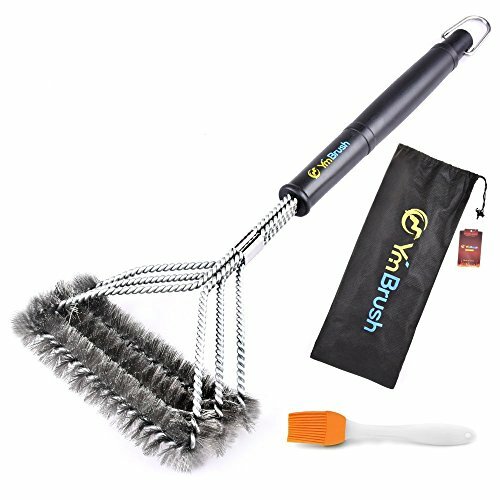 The BBQ Grill Brush by USA Kitchen Elite is an 18-inch grill cleaner made out of stainless steel and that works efficiently on all grill surfaces: multiple gas grill, charbroil, porcelain, infrared grills or smokers. You will really love the range of equipment this universal grill brush, which actually comes in a set of three: the brush, a handy bag, and a basting brush as well. It is ideal for cleaning up a variety of grills, including charcoal type, porcelain and infrared. Its unique design ensures that each of the three brushes comes with its own special stroke, with its innovative 360-degree rotator blade crafted to clean up hard corners. You can clean both the top, bottom and the sides of the grill with one single stroke, thanks to its unique 360-degree design. It comes with a basting brush in the package, as well! 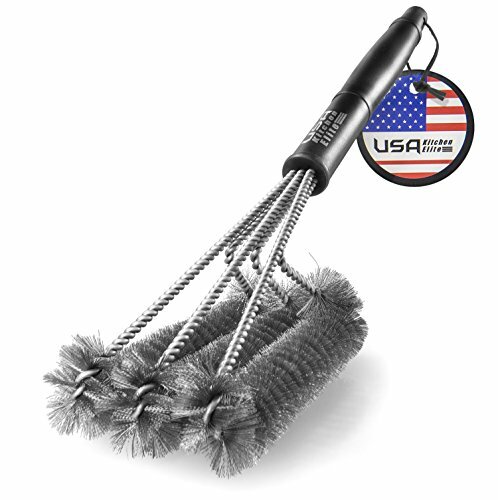 The BBQ Grill Brush by USA Elite Kitchen is definitely a great choice when it comes to cleaning your grill: it will not only do its job on every grill grate surface you can imagine, but it also comes in a set of three for an affordable price! 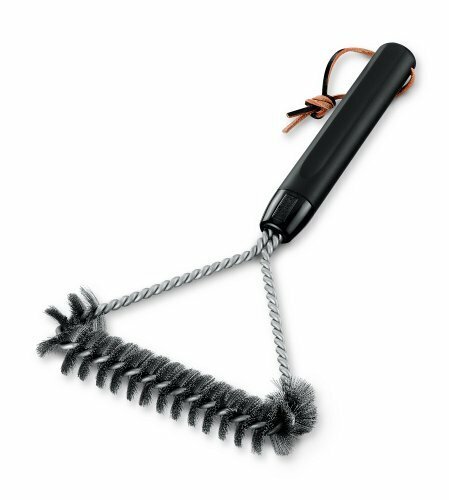 This is a tough brush perfectly crafted thinking in those wanting to do some heavy-duty grill cleaning. It is strong yet lightweight, enabling a lifetime of effortless cleaning. Lastly, its 360-degree feature is one of a kind on the market. 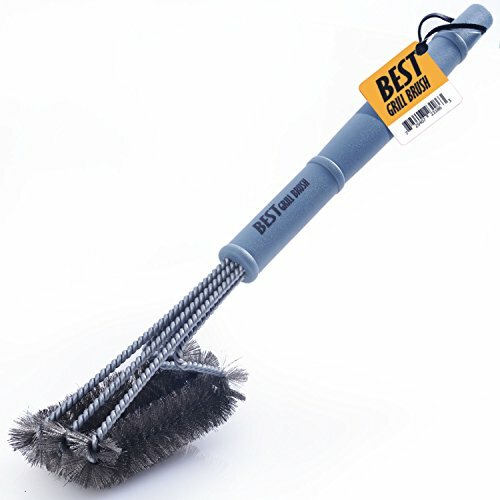 The BBQ Grill Brush by Best is a grill cleaner that works well when removing a whole lot of mess from all types of grill gates without causing any damage to the surface. Its 3-in-one brushes ensure faster cleaning across all sides and from top to bottom. It is well-matched with any type of BBQ grill: charbroil, Weber, gas grills, infrared, ceramic, you name it! As long as your hands can take a bit of roughing up now and then, the Best BBQ Grill Brush is an excellent choice to keep your grill clean. This brush is quite a steal for its price and is one of the few on the market whose bristles will not fall off on your food. It may take a strong hand to use it, but this also means that it will offer you a deeper, better cleaning when it comes to scrubbing off grease from the sides or bottom of your grill, no matter which material it is made from! When it comes to blending toughness with softness, the Rondo is among the best, and not without a reason. 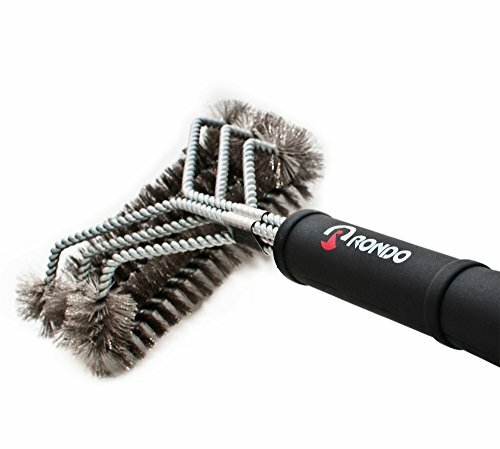 Though not crafted to last forever, this RONDO grill brush does have the advantage of an excellent design, which ensures effective cleaning of the corners with uniform and minimum pressure application. It also comes with a bag where you can keep it safe while transporting it for a picnic on the park or for a trip. Lastly, it is truly a brush that is hard to bend, which means that if you decide to acquire it, you will be buying a durable, long lasting grill brush that will keep any of your grill surfaces clean. Just be aware that some of the bristles may come off so as long as you keep an eye on this, the RONDO BBQ Grill Brush is a great, durable choice! The HUKOKER is a competent tool for your kitchen, and it is a brush that has a great number of features that lend efficiency to its operations. Overall, this seems to be a strong, heavy-duty brush designed to meet your entire grill cleaning needs and leave your grill grates free from grease and burnt debris. The time required to clean also diminishes greatly thanks to the three rows of bristles, making the whole process after the barbecue faster! The handle is also comfortable to hold on to, and it works on all grill and smokers surfaces without leaving any scratches or ruining the material. To select a brush that will fit your needs best, you must first take into account certain factor such as which material your grill grates are made of: porcelain, steel, ceramic, etc. Keep in mind that some brushes only work well on certain surfaces without scratching others! In addition, if you happen to love doing barbecues out in the park, then a brush that includes its own storing bag is the right choice for you. This means it’s a good idea to consider all of the features a grill brush has in order to decide whether it is the perfect match for you or not. Lastly, how much you want to invest on your grill brush will also reduce your options, as prices vary greatly according to the brand and the quality. However, you should always opt for a grill brush that will keep your barbecue grill sparkling clean without leaving steel bristles on your food! The most important thing when you are choosing a perfect brush to keep your grill grates clean from debris is to keep in mind that clean tools are happy tools. A bit of a cliché yes, but it holds truth. If you clean your grill with the best grill brush, which is also regularly kept clean, both your grill and your brush will last a long time. This will save you money on new products in the long run and keep your food safe and hygienic when you cook on a nice clean grill. So go on and give some love to the brush of your choice by putting some soap on it and washing it under running hot water. The cleaner your brush, the cleaner your grill!